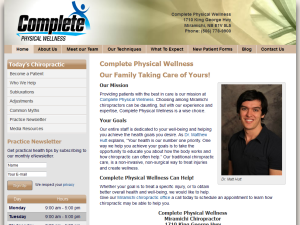 Lakeville chiropractor serving Lakeville and the neighboring communities since 2007 offers Diversified, Thompson, CBP and Activator Methods® techniques. Drs. 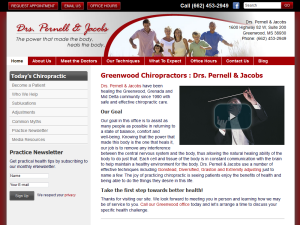 Pernell & Jacobs offers quality chiropractic care to the Greenwood, Grenada and Mid-Delta communities since 1990. 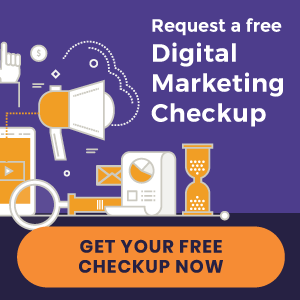 Dr. Gary Tennant and Dr. David Tyssen of Park Forest Chiropractic offer Diversified, Pro-Adjuster, Flexion-Distraction, Activator Methods®, Thompson and Graston adjusting methods. 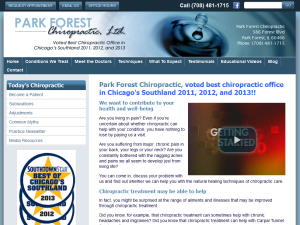 Acupuncture, Ultrasound, Decompression, Chiropractic Physician Exercises and Nutritional Counseling are also available. 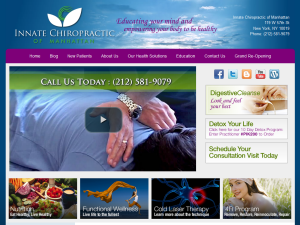 New York Chiropractic College graduate provides chiropractic and wellness care in the Manhattan, NY area since 1996. 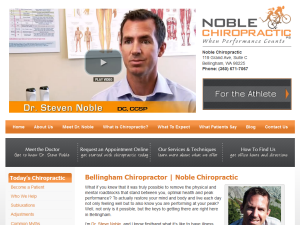 Nutritional Counseling, Weight Loss Programs, Custom Orthotics, and other services are also available. 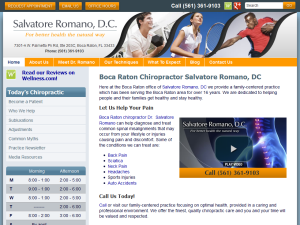 Palmer College of Chiropractic graduate serving Boca Raton and West Boca Raton community since 1992 with Activator Methods®, Gonstead, Palmer Package, SOT and Thompson techniques. Logan College of Chiropractic graduate serves Orleans, ON with Diversified, Activator Methods®, SOT, Thompson, Logan Basic, Cox Flexion-Distraction and Torque Release adjusting methods. Also offers Orthotics and Laser Therapy. Western States Chiropractic College graduate serving Bellingham community since 2006 with Diversified, AK – Applied Kinesiology, Torque Release, ArthroStim, N E T (Neuro Emotional Technique), Erchonia Laser Therapy and Kinesio Taping techniques. 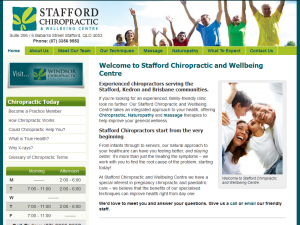 Stafford Chiropractic and Wellbeing Centre offers Stafford and the neighboring communities with corrective chiropractic care along with Massage and Naturopathy since 2004. 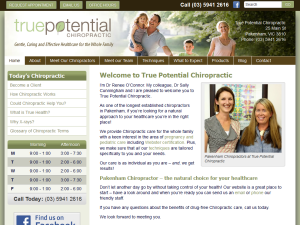 True Potential Chiropractic serves Pakenham and the neighboring communities since 2007 with Diversified, Gonstead, Thompson, Activator Methods®, SOT and Bio Cranial chiropractic techniques. 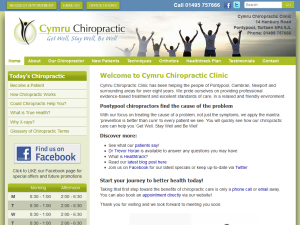 University of Glamorgan graduate provides chiropractic care in the Pontypool and the neighboring communities since 2005. Orthotics are also available. 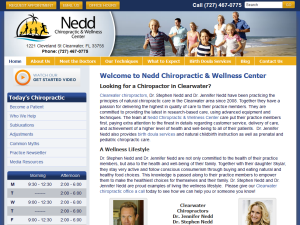 Nedd Chiropractic & Wellness Center serves Clearwater area since 2008 with Activator Methods®, Applied Kinesiology, and Diversified chiropractic techniques. Acupuncture and Cold Laser Therapy are also available. 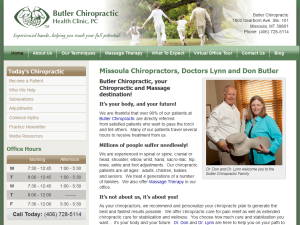 Butler Chiropractic offers Missoula and Western Montana residents with corrective chiropractic care along with Massage Therapy since 1989. 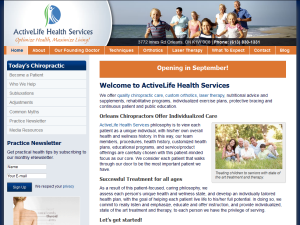 Mount Allison University graduate provides chiropractic care in the Miramichi, Chatham, Douglastown and Newcastle families. « Phew! FutureFit Officially Complete!